Nivea Lip Butter in Caramel Cream Kiss-Again, another lip product that smells delightful. Pictured is the American version of this product which Hannah kindly sent me, but you can get this one in New Zealand also. This is creamy, and a bit thicker than most lip butters so it's best to apply this at night. Again, if your lips are particularly dry or damaged, this will be perfect to keep them moisturised and smooth. Lush Santa's Kiss Lip Scrub, limited edition-I feel mean for featuring this, especially as it was limited edition-sorry folks! In my opinion though, it is one of Lush's best lip scrubs. Like the Fresh lip polish this has more of a gel feel to it. Its scent reminds me of coke bottle lollies, nom! Again, this is great if you favour a matte lip, but also if your lips are in need of some TLC. Dior Creme De Rose Lip Balm-I've tried many a lip balm over the years, including countless Lip Smackers-but none of them come close to this offering. This lightly scented rose balm applies creamily and then dries matte on your lips. It isn't drying and leaves your lips so smooth and conditioned. It works well on any stubborn dry patches as well. Yes, this is more costly but it is worth the splurge. Burt's Bees Refreshing Lip Balm with Pink Grapefruit-This was another treat Hannah included in my package (thanks Hannah!) and I love it. Again, it is deliciously scented (noticing a theme here?) and is one of those products I often find myself throwing into my bag when I'm heading out or sitting on my desk to apply to my lips during the day. *Have you tried any of these lip products? Which are your favourites? Me too! 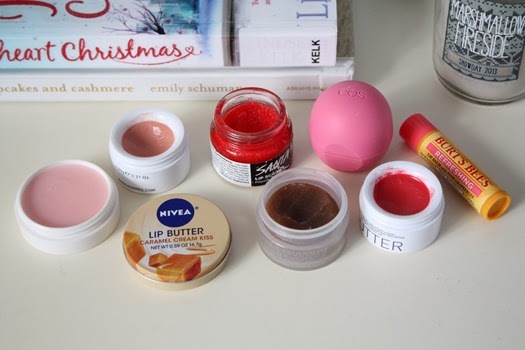 Their lip butters in particular are fantastic but the chapstick ones are great also.